Alibaba yesterday morning announced it would give away RMB600 million (around US$97m) of “lucky money”, with RMB156 million in cash and RMB430 million of e-coupons from merchants on its marketplaces, to users from today until February 19, the first day of the Lunar New Year. Although Alibaba’s online payments service Alipay added a ‘lucky money’ giving feature several years ago, the new ways of distributing lucky money on WeChat a year ago was an immediate hit among users and a popular marketing approach for businesses. 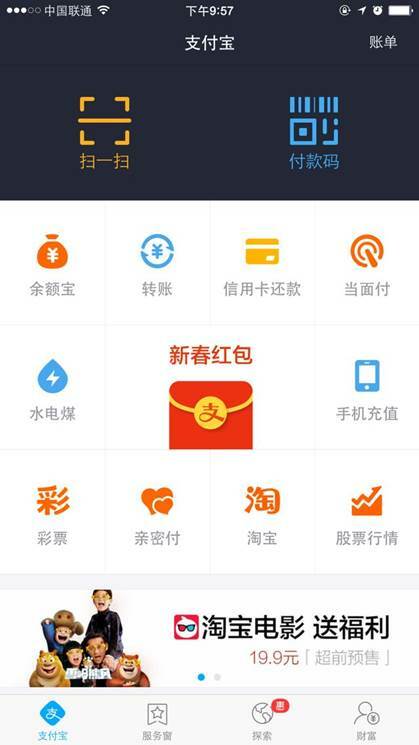 Two weeks ago Alibaba released the latest version of the mobile app Alipay Wallet, challenging WeChat with a revamped lucky money giving feature. Shortly afterwards, users were able to share Alibaba’s digital Red Envelopes with their WeChat friends or onto WeChat’s sharing platform Moments. After clicking open a Red Envelope, money was then automatically transferred into their friends’ Alipay accounts. WeChat immediately disabled the capability, the two have been fierce rivals since Alibaba launched competing messaging app Laiwang, with Alibaba disabling webpages from its marketplaces being displayed on WeChat. A solution was swiftly provided by Alibaba: if a user wants to give lucky money to their WeChat friends through Alipay Wallet, they can generate an image with a number and share that to WeChat, and his or her WeChat friends can go to Alipay Wallet and type in the number. So it’s not surprising that yesterday afternoon, just half a day after Alibaba’s announcement, WeChat announced it would give away RMB500 million (around US$81m) cash and RMB3 billion (around US$484m) of e-coupons from tomorrow night. Alibaba yesterday also announced that the four Chinese tech companies in which it has invested (Weibo, Youku-tudou, Momo and Kuaidi) would join the fight against WeChat in this “digital lucky money war”. Users of Weibo, the leading micro-blogging platform in China, have been able to send digital Red Envelopes to their followers. A year before the launch of WeChat’s Red Envelope feature, Weibo organized a big campaign encouraging ordinary users to ask for Red Envelopes from celebrities or big names on Weibo. Social app Momo added a lucky money giving feature last month. Alibaba-backed taxi app Kuaidi and its direct competitor Didi, ventured backed by WeChat’s parent company Tencent, have been marketing themselves with Red Envelopes. The new way of e-coupon giving or sharing was inspired by WeChat’s lucky money giving feature. WeChat’s money giving feature was launched just before Spring Festival 2014, when Chinese traditionally give lucky money to the younger generations. Apart from sending money to selected WeChat contacts, the feature enables multiple people in a chat group to share the gift. The amount can be divided randomly while senders can set how many people can receive, making group members even more keen to open the Red Envelopes. Employees in a WeChat group could ask their bosses for Red Envelopes, and businesses could send them to their clients. 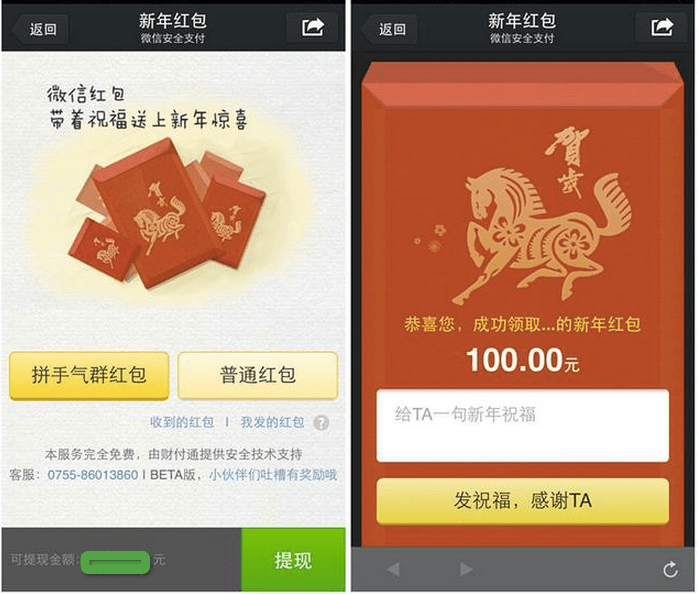 About 5 million users participated in giving and receiving lucky money during Spring Festival 2014. The forthcoming Spring Festival Gala will apparently invite viewers to use WeChat’s Shake feature to receive Red Envelopes. WeChat messages carrying random amounts of money will be transferred to the user’s WeChat Wallet upon opening. The money given away will be from the show’s sponsors. This is considered a better advertising approach than TV commercials or other traditional methods. It has been reported that RMB100 million (US$17m) will be shared among 10 million users. WeChat Red Envelopes were quickly adopted by businesses for marketing. People who never click on a promotional message were much more likely to click open WeChat Red Envelopes shared on Moments, WeChat’s content sharing platform, or from friends. It turned out to be a perfect marketing method for internet services such as taxi and food delivery apps, which currently subsidize users. These apps generate Red Envelopes for users to share with their WeChat friends or onto Moments. Inevitably, the Red Envelopes were even used for bribery, the advantage being that it is difficult to identify senders. In September 2014 the Chinese government warned party members to keep away.